Place 1 chicken breast half, boned side up, between 2 pieces of plastic wrap or waxed paper. Working from center, gently pound chicken with flat side of meat mallet or rolling pin until about 1/4 inch thick; remove wrap. Repeat with remaining chicken breast halves. In medium bowl, combine bread crumbs, Parmesan cheese and parsley; mix well. Dip chicken in beaten egg; coat with bread crumb mixture. In large nonstick skillet, heat oil over medium-high heat until hot. Add chicken; cook 8 to 10 minutes or until chicken is fork-tender and juices run clear, turning once. Meanwhile, heat spaghetti sauce. Sprinkle chicken with mozzarella cheese; cover skillet to melt cheese. 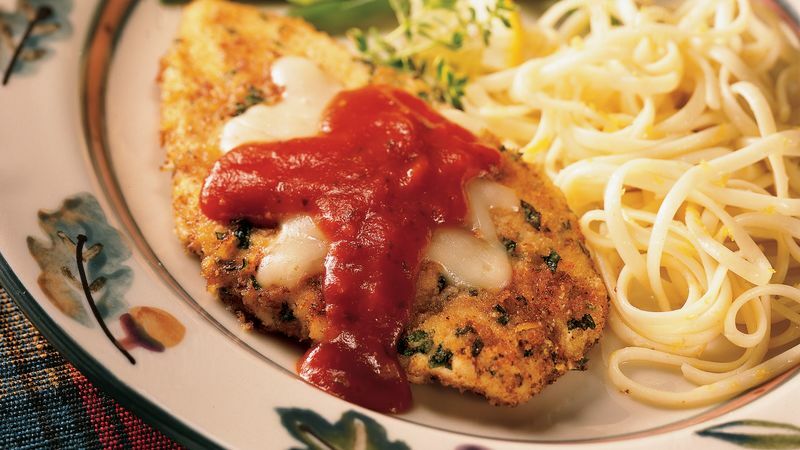 Serve sauce with chicken. Regular parsley can be used in place of the Italian parsley. Italian parsley has large flat leaves and a stronger flavor than regular curly-leaf parsley. Pound the chicken breasts and coat them with the crumb mixture a couple of hours in advance. Cover and refrigerate them until you’re ready to cook. To complete this Italian meal, serve Italian green beans and cooked pasta tossed with olive oil and fresh lemon zest.